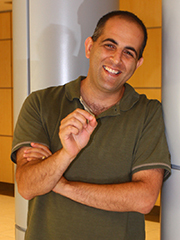 Assistant Prof. Roee Amit is interested in deciphering the regulatory pattern (code) of the gene expression in cells through the study of live dynamical imaging of single RNA molecules in single cells, and using this information to construct novel biological scaffolds capable of triggering a response using synthetic biology approaches. The long term goals of this research are for the development of smart therapeutic applications and alternative biofuel production. One of his studies examines the natural biological process of a termite in breaking down cellulose into sugar, which can have long-term applications in attaining glucose from cellulose (the most abundant organic polymer on Earth) for the production of fuel. Amit is an Assistant Prof. at the Department of Biotechnology and Food Engineering and a member of the GTEP-led I-CORE solar fuels program. He heads the” Synthetic Biology Laboratory for the Decipherment of Genomic Codes,” where he mentors and conducts research with talented graduate students at MA and PhD levels including a postdoc research associate. He has plans to enter a Technion student team to the prestigious International Genetically Engineered Machine competition (iGEM) in the coming academic year. Over the years he received a number of noteworthy research grants, including the Marie Curie Career Integration Grant (CIG), the ISF-Research Grant and others.